Chapter 2: Trollskull Alley is the sandbox of the Waterdeep: Dragon Heist campaign. It's where you and the players get to set your own pace, create unique stories and forge a lasting relationship with Waterdeep and its residents. But, as is often the case, freedom can become overwhelming. What should you use from the chapter? How do you use it? When? For who? The goal of this document is to help you find the answer to those questions and provide the tools to create a fun and manageable sandbox for your players. You'll find advice and embellishments on nearly everything that's described in the chapter, which will hopefully help you DM the chapter. Meeting the Neighbors - Advice on how to handle Lif the Poltergeist, as well as two small sidequests that'll help you introduce and flesh out the other residents of Trollskull Alley. Open for Business? - Ideas on how to make the tavern renovation more affordable - and some options for securing a loan - as well as variant rules for running and profiting off the tavern in Trollskull Manor. Joining Factions - Reviews of each of the player-available factions to help you choose the right factions for your party. Downtime Options - Discussion of the downtime options presented in the Xanathar's Guide to Everything, as well as ideas on how they can be altered and flavored to fit with Waterdeep and the campaign. Making a Plan - Lastly, everything is brought together and you'll be given general advice on how to plan and organize chapter 2, so that it's manageable to run and entertaining for your players. A Trollskull Manor Map - a map showing an unfurnished Trollskull Manor, in case your players want to do their own interior decoration. NOTE: If you're looking for help with the factions and faction missions described in Chapter 2: Trollskull Alley – including full-fledged sidequests, VTT-ready battlemaps and DM's Resources – check out our products for the Gray Hands and the Zhentarim. I bought the entire bundle, without having purchased any other products from the authors before for two specific reasons. 2) The well written copy describing exactly what resources were contained within the product. I took this as an indicator of the quality of writing within the product. While the maps are well executed, I didn't even care when I made the purchase. I have not been disappointed. My primary interest was in this Trollskull Alley resource, and it provides substance on the areas the descriptions tells you it is going to cover. The advice about handling downtime, and the structure to fill the gap left by the module as written, are both worthwhile. The guidance on the players acquiring capital and from whom, are what many people running WDH are looking for. While I may have considered some of the same strategies, they are so well developed...See more in the text, I'm glad I saved myself the time. The proposals on how to handle and or vary the business rolls was crisp and easy to follow. If you are looking for material to give more depth to the diverse metropolitan neighborhood WotC has provided in Trollskull Alley, the Meeting the Neighbors vignettes expand on and operate within the spirit of that subsetting. All in all, this was the supplement that Ch. 2 that I needed for WDH. I literally cannot open the non-printer friendly version of this. It pops an error on any and all pdf reader. 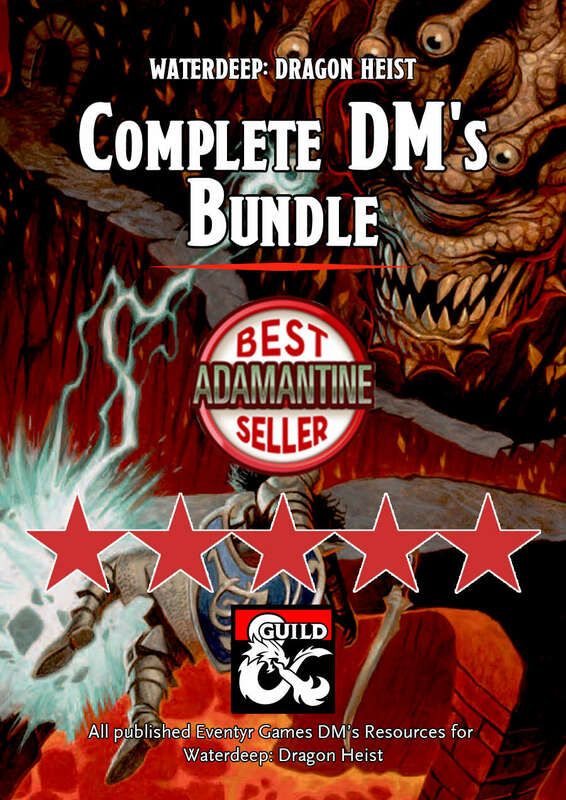 Great products, i have purchased all of them and they are truly helping me with my first time Dm-ing, my players are all spread out across the factions, do you have plans to release modules for the rest of the factions as well? Thanks! That really means a lot to us :). We have plans for it, and we'll probably release them in smaller products, so we can get some out quicker. We're hoping to have something out for the Zhentarim before too long. Which factions are your players in? thank you your guides have really helped! I'll make sure to update you if we drop something along the lines of what you're looking for. Are there any plans to release a Schley style map of Trollskull Manor on your website like you have done with other DH maps? I wish I could say yes, since that's actually a great idea. But right now, we're hard at work publishing supplements for the faction missions and chapter 4. But, I think we might get around to it in a few weeks time - without making any promises. Thanks! printer friendly version working well. After buying the first chapter helper (I loved it!) As soon as I saw this one I bought it. It's nearly as comprehensive as the first one but (to me) feels slightly rushed at the end. I would've liked to have seen a little greater expansion on the information on the guild interactions. That said, it's definitely not a deal breaker for me and i look forward to further releases for the next chapters in the book. These helpers are incredible resources for DMs to give enhanced and expanded ideas for areas where you might not think of something to flesh out the story lines so I'm extremely appreciative of them. Do you mean the interactions with the various merchant guilds of Waterdeep, or do you mean with each of the factions, the characters can join? We wouldn't say we've rushed anything, but we did have to make some choices about what to elaborate on, if we wanted to get the product out in time for people to purchase it before running chapter 2. But, if there's anything we should've covered, we'll make sure to get it covered in an update ASAP. Don't take my response as negative, more like a personal critique as to how I read it. I meant more along the lines of the merchant guilds, the factions seemed to be pretty clear (to me). Understandable about the time table, it just feels like the factions were well expanded on and then when it came to the merchant interaction it was like "and then there's this stuff to do too". As I said, totally not a deal breaker. Your releases bring what would be a mundane encounter or description and bring it to life, and give me ideas I honestly never would have thought of. Regardless of my critiquing opinions, you have excellent products and I'll be there to purchase every chapter release you have for Dragon Heist. I appreciate the critique - and I don't think you're wrong either. 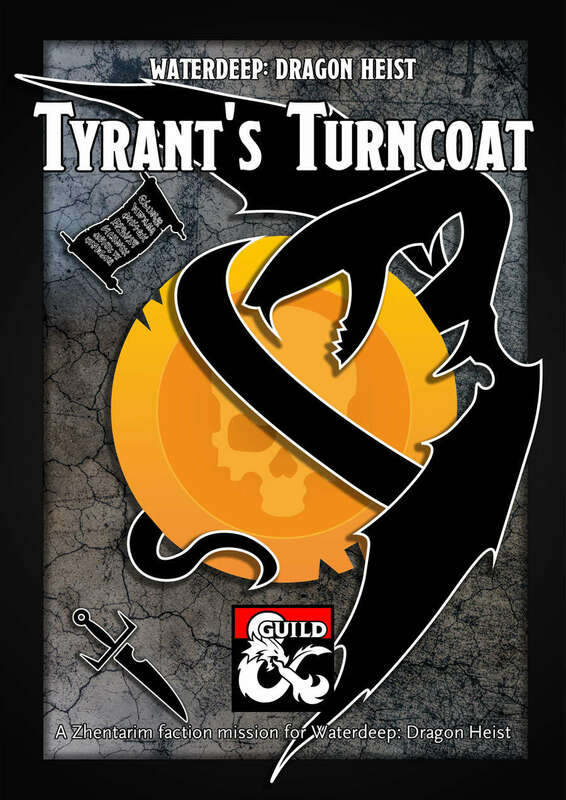 For me personally (one half of the team), I felt the campaign book did a decent job explaining the guilds, describing guild personalities and the business rival. But I think you're definitely right, if there's a part of the chapter that could have been played more with (guild sidequests, complications, etc. ), it would certainly be the merchant guilds. We'll try and see if we can get back to it with an update - I can't say for sure when, since we're pushing to get as much material out before Waterdeep: Dungeon of the Mad Mage drops. But we really do appreciate your opinion - without honest input, we wouldn't be able to improve our material, and that's what most important in the end :). Hi, just bought this PDF (it's Great!) but can't find a printer friendly version. And thanks for letting us know, that the printer friendly version was missing. We updated the product recently, and somehow the printer friendly version didn't get uploaded. It should be fixed now. The first side quest deals with possible homophobia and handles it well. But in the next quest, Paper Problems, the text continually refers to Fala as a 'she' when w:dh explicitly states that the correct pronoun is 'they'. I hope that you update your pdf's to reflect this and foster the inclusivity that WoTC took care to foster while creating the module. We thought we'd made sure to make mentions of Fala gender-neutral, but you're absolutely right, that we missed it twice. We're sorry about that and we've updated both PDF's with the correct pronouns. Thanks Valeur. This product has been very helpful and I see you just released one for Chapter 3 as well! I'm sure I will be picking that up as my players progress. Great resource for a new DM, but you may want to think about including a printer friendly version (just remove the "background" layer when converting to pdf). It's a bit of a waste of ink/toner to print out all the background noise, and it doesn't look as nice in black and white. Thank you - and thanks for buying!